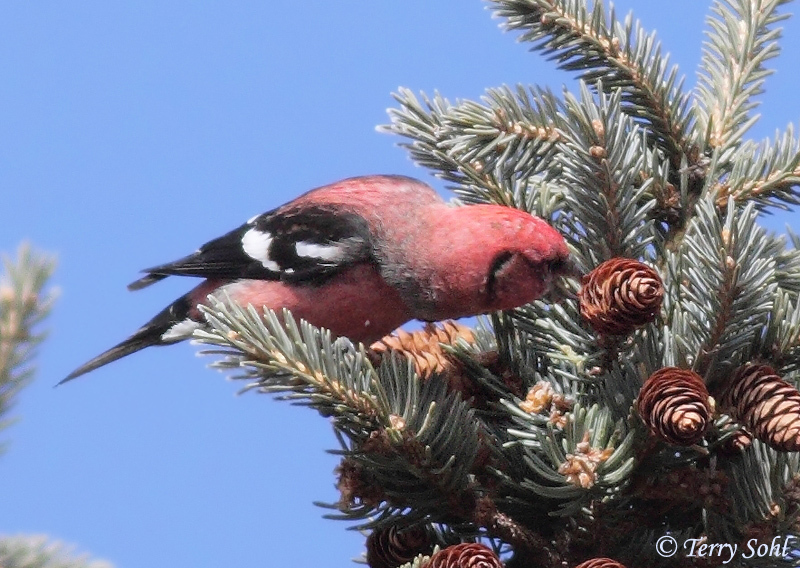 ID Keys: Males pink overall, black wings with 2 bold white wing bars, black tail, crossed-bill. 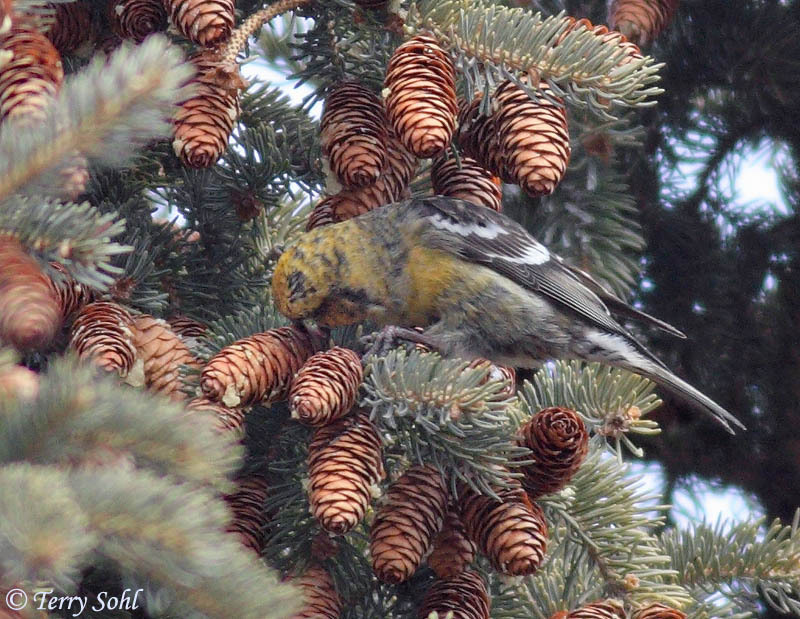 Females similar but yellowish overall. 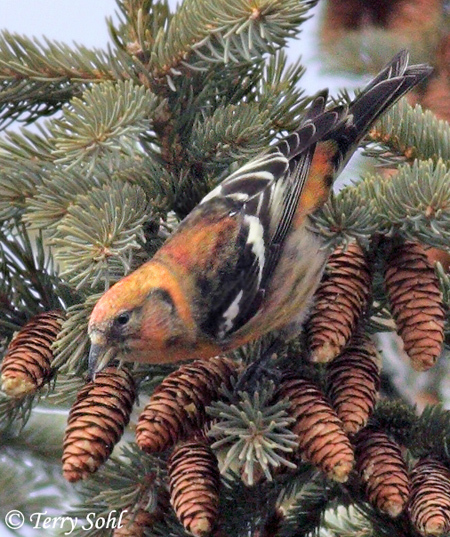 White-winged Crossbills are true nomads, wandering in large flocks throughout much of the boreal Northern Hemisphere. 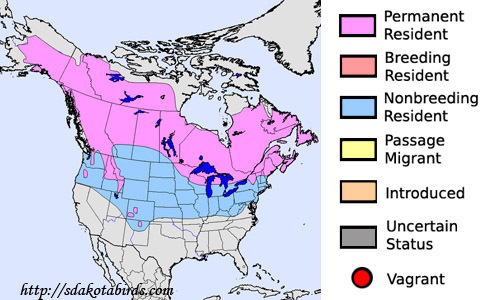 While normally found in Canada and Alaska, in the winter, irregular irruptive migrations may bring large flocks deep into the continental United States. 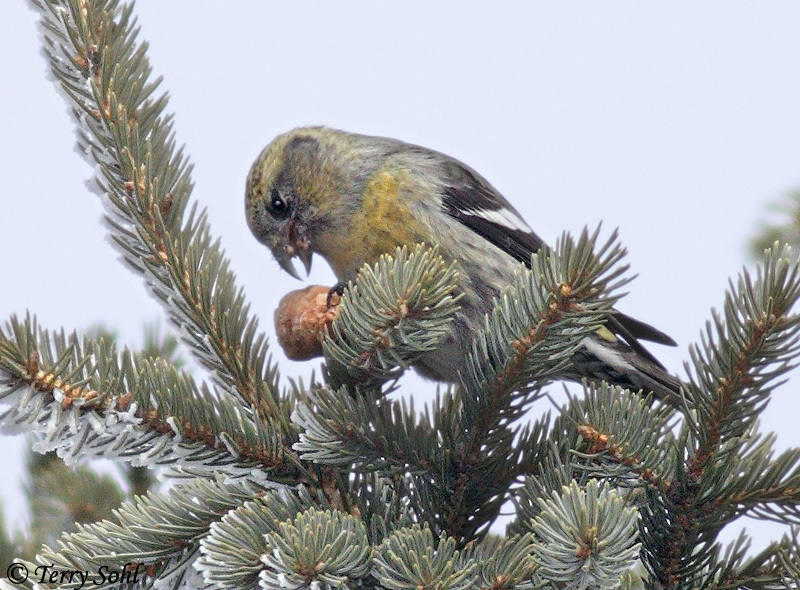 Their unusual crossed bills are extremely effective at opening their favorite food item, the seeds of spruce trees. 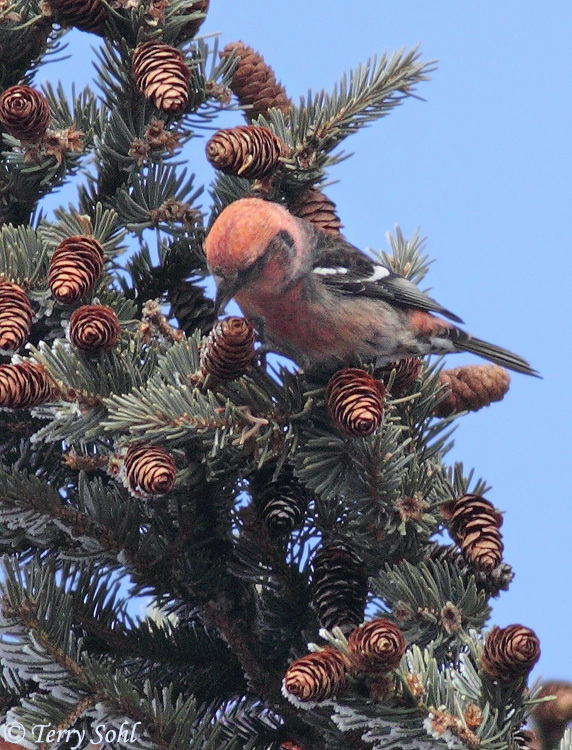 Habitat: Nearly always found in conifer forest. 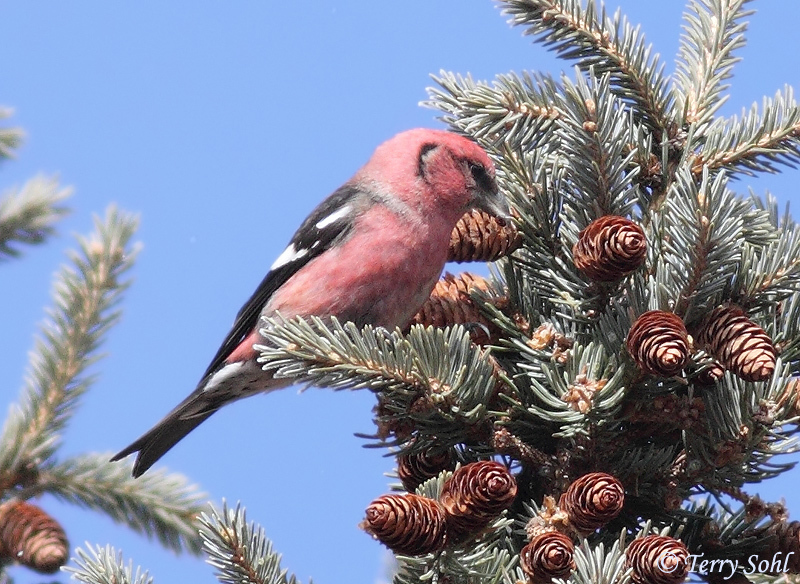 Breeding usually occurs in forests with high densities of spruce trees. 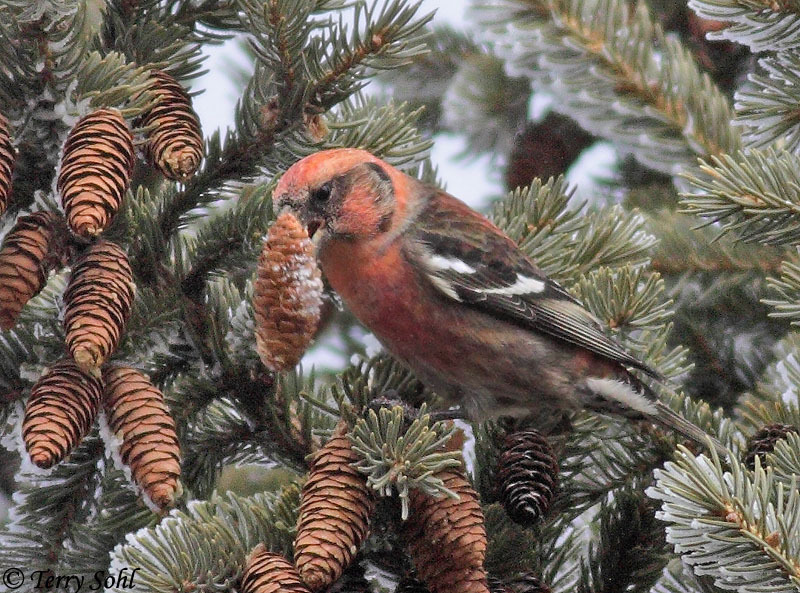 Diet: Primarily feeds on spruce seeds if they area available. 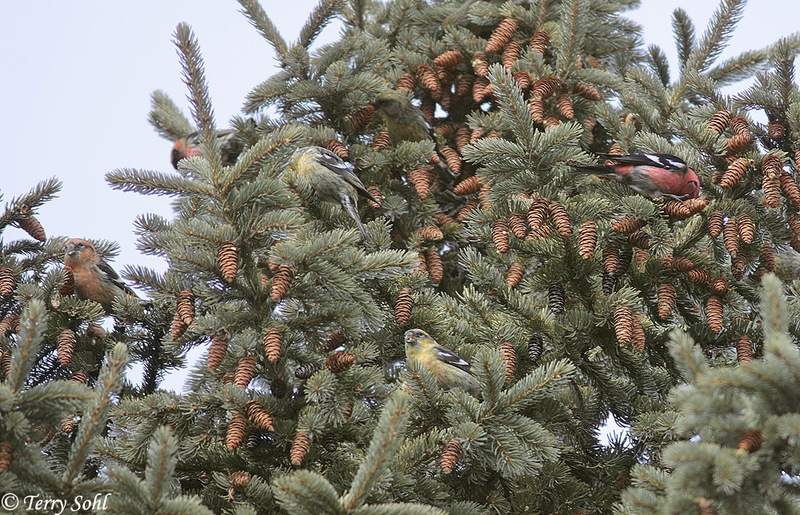 They will also feed on seeds of other conifers, tree buds, berries, other seeds, and insects. Song: Variety of musical chattering and warbling. 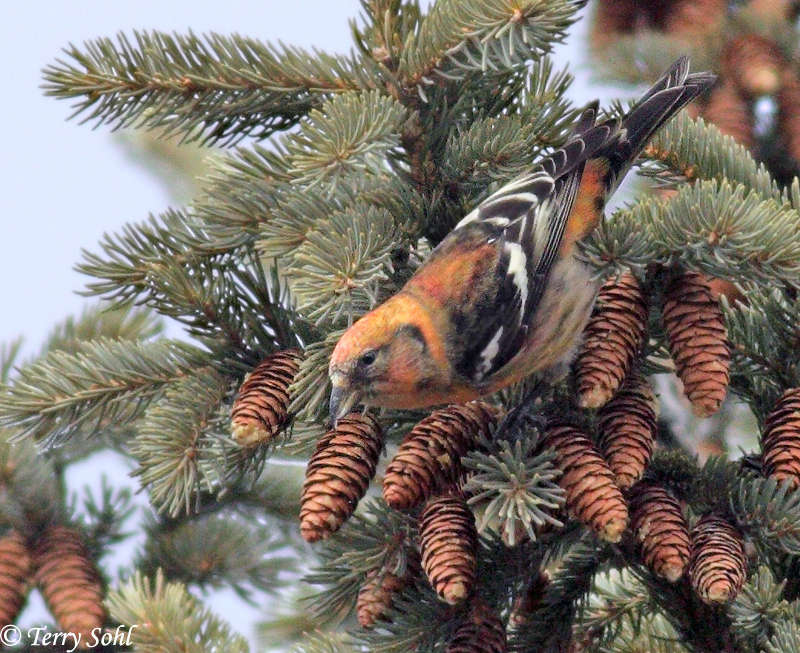 Migration: They can be found in all seasons throughout much of Canada, Alaska, and New England. 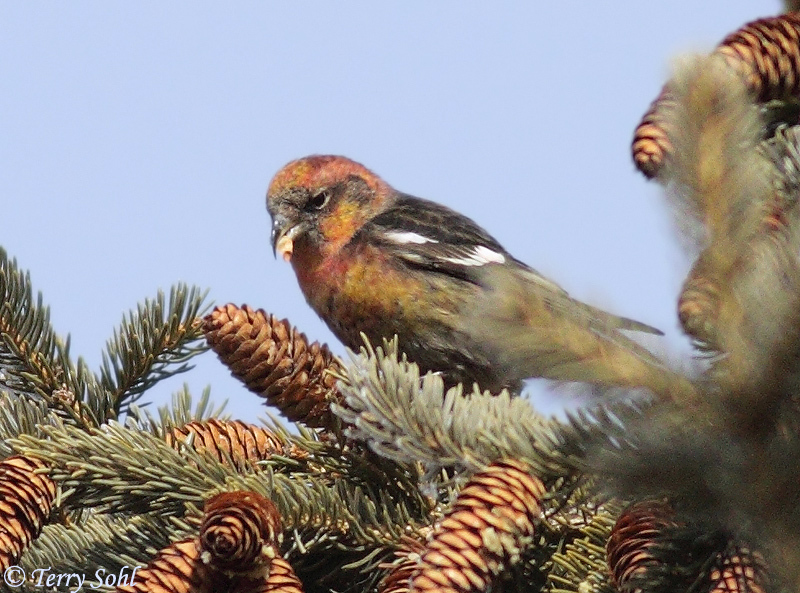 While not strictly migratory, individual flocks will sometimes move great distances in winter in the search for food, and could possibly be found nearly anywhere (in the proper habitat) in the northern half of the U.S. in winter. Bird Feeders: Will come to feeders for sunflower seeds. 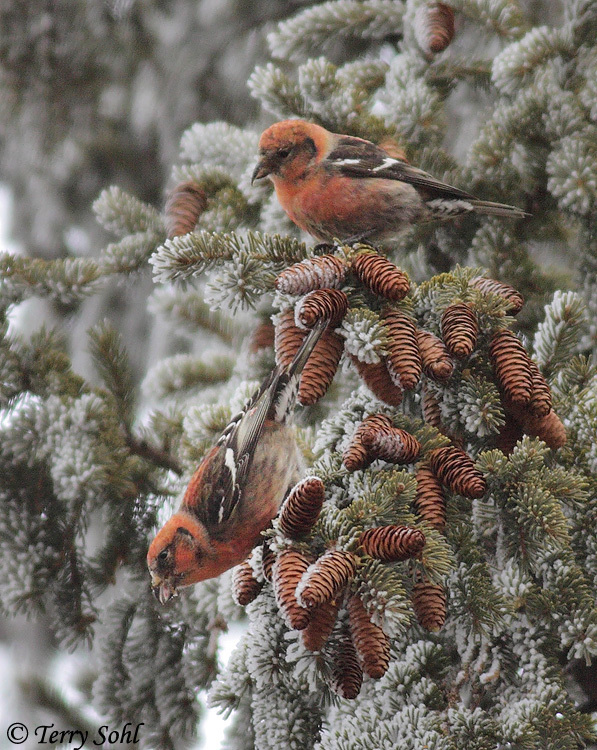 Conservation Status: Difficult to monitor populations because of irregular migration habits, but it's thought numbers rise and fall with the availability of conifer seeds. There are no major conservation concerns with the species, however, and it is listed as a species of "Least Concern" by the IUCN. 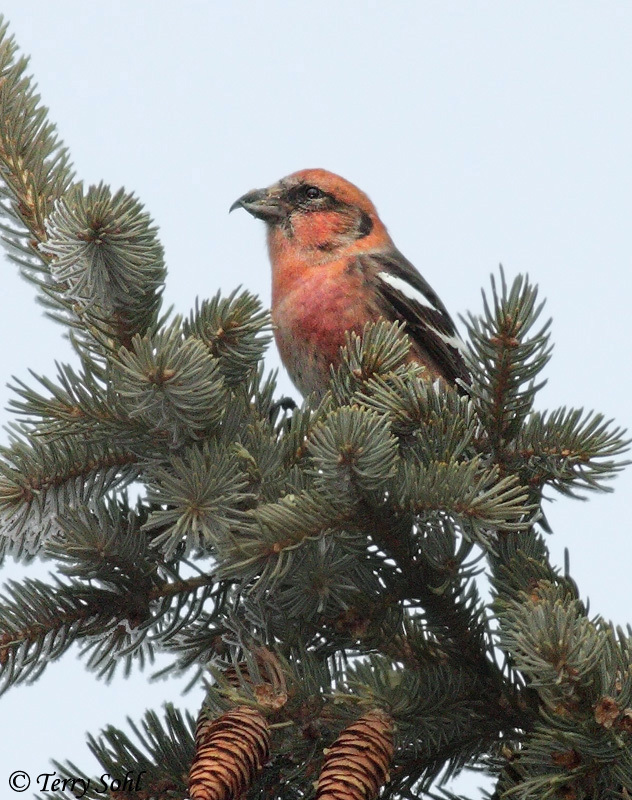 2) WhatBird - White-winged Crossbill. 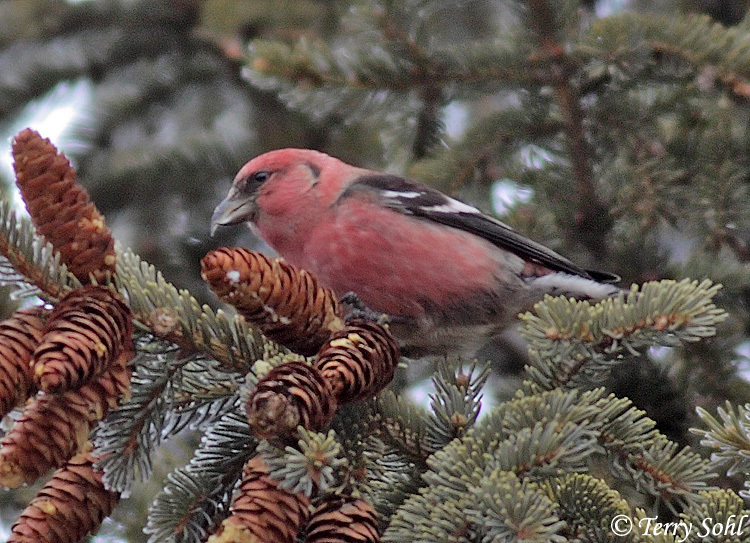 South Dakota Status: Irregular uncommon to rare winter visitor, most common in the northeastern part of the state.